Gwyneth Paltrow is an actress who always wears awesome dresses, but became more famous for her chandelier earrings at the 2007 Academy Awards. At parties, people have been known to get drunk and hang from chandeliers, but hanging chandeliers from a woman is an even more painful and embarrassing sight. Gwyneth’s earrings in this case had more diamonds than all of South America put together, proving once and for all that you can in fact have too much of a good thing. They were so big and hung so low from golden chains that she could have tripped over them. As diamonds go, the stones were pretty, but these chandelier earrings should have just gone down the red carpet themselves because they had a life of their own. This ring was quite large and looked as though a metallurgist spilled hot gold all over her finger and just before it cooled, he threw some precious gems on top of it. Imagine that after the ring hardened and Sandra got back from the hospital to have it surgically removed, she waited for the skin grafts to heal before she put the ring on again. It is easy to visualize a major law suit where the ring maker lost his house. Sandra put the ring on anyways and arrived at the award show. Of course she looked beautiful, but that ugly ring drew enough attention to make this list. 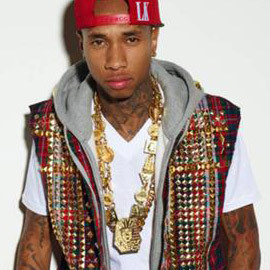 This necklace was quite impressive in making Tyga look like a Pharaoh from ancient Egypt. It was designed by Jason of Beverly Hills because all the other designers were not strong enough to keep from being turned to stone by the necklace's presumably evil powers. Tyga's idea to wear this at the 2012 BET Awards was a good one until all the other rappers saw it and wanted one just like it. It had so much gold in it that Fort Knox itself is probably jealous, which isn't necessarily a bad thing, until you see the design itself. The ugly necklace had scary faces on it and made Tyga's weight jump up to 250 pounds. It was gaudy and heavy. As far as puppets go, Miss Piggy is probably the world's most famous fashionista, but even she is not immune to fashion disaster. She recently wore a big old diamond necklace. The Bible says never throw your pearls before swine. In this case designer Fred Leighton did not use pearls, but he should have applied the concept to diamonds. The necklace was quite large and ugly. 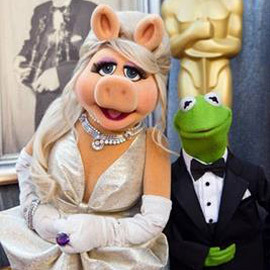 The multiple diamonds on this beast (the necklace, not the Muppet) blinded Piggy's counterpart Kermit the Frog as well as all the others standing on the red carpet at the 2012 Academy Awards. Why should designers even put real jewels on a bunch of sewn together fabric? Why is a Muppet even at an awards show? The necklace had a interesting infinity symbol and lots of diamonds. It surely weighed more than the pig. The real star wearing it was the guy you never see; Eric Jacobson was the puppeteer who handled her. He probably never held that much value in his arms before or since. Flavor Flav has long been associated with the '80s hip-hop trend of wearing a clock around your neck, because he was one of the artists who popularized it. However, even the master of neck clocks himself can go too far sometimes! 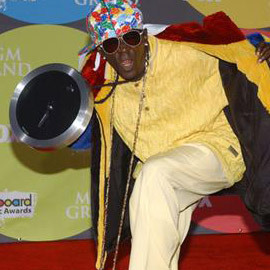 It would have been impossible for Flav to be late for his red carpet arrival at the 2006 Billboard Music Awards because the ugly necklace he had on was quite possibly the biggest clock ever. Big Ben in England was weeping and the Hubble telescope was taking this photo from space, even though an astronaut could have seen this silver and black clock with the naked eye. This is a guest post written by Jessica. Jessica is a journalist and blogger who specializes in fashion, style, and fine jewelry. She lives in New Jersey with her fiance and two cats.